LONDON—Mitt Romney accused President Barack Obama of having "diminished American leadership" around the world with his foreign policy approach and suggested his administration had put the lives of American service members at risk by leaking classified national security details to the media. In a hard-hitting speech before the Veterans of Foreign Wars convention in Reno, Nev., the presumptive Republican nominee slammed Obama on an array of foreign policy fronts—including what he described as Obama's "shabby treatment" of Israel. And echoing his usual message on the campaign trail, Romney trashed Obama's handling of the nation's economy, arguing it has made America's position in the world even weaker. "The president's policies have made it harder to recover from the deepest recession in 70 years, exposed the military to cuts that no one can justify, compromised our national security secrets, and in dealings with other nations, given trust where it is not earned, insult where it is not deserved, and apology where it is not due," Romney declared. "American leadership depends, as it always has, on our economic strength, on our military strength, and on our moral strength. If any of these falter, no skill of diplomacy or presidential oratory can compensate." Romney stepped up pressure on Obama to investigate whether members of his administration are leaking classified security details to benefit his presidency. He called on Obama to appoint a special counsel--calling the leaks a "national security crisis" that puts the "lives of American servicemen and women… at stake." "Exactly who in the White House betrayed these secrets? Did a superior authorize it? 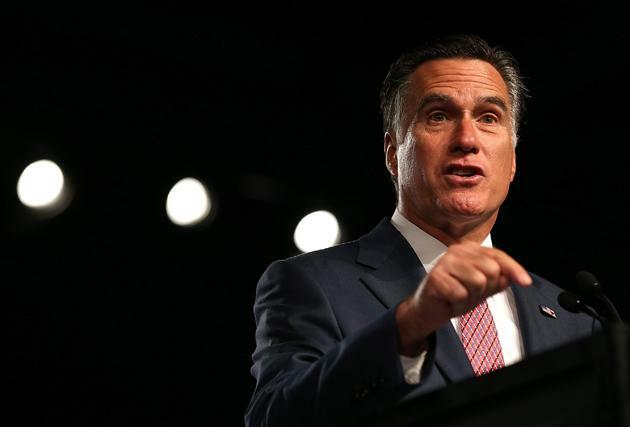 These are things that Americans are entitled to know--and they are entitled to know right now," Romney said. "If the president believes--as he said last week--that the buck stops with him, then he owes all Americans a full and prompt accounting of the facts." The 25-minute speech was meant to set the tone of Romney's upcoming trip overseas. Ronney is scheduled to arrive in London on Wednesday; he'll attend the opening games of the 2012 Summer Olympics and meet with top British officials before heading onto Israel and Poland. Echoing what his staff had told reporters in recent days, Romney said in his VFW speech he would not use his trip to criticize a sitting president on foreign soil. But, he added, "I will tell you right here, before I leave" what he thinks about Obama's foreign policy. Among other things, Romney slammed Obama's cool relationship with Israel. He said Obama is "fond of lecturing Israel's leaders" and said the country deserves "better than what they have received from the leader of the free world." The GOP candidate suggested Obama's decision to withdraw U.S. troops from Afghanistan by the end of 2014 was politically motivated. But Romney quickly added that, if elected, he would also work toward the 2014 timeline—as long as commanders on the ground supported the move. Romney offered perhaps his sharpest critique on Obama's relationship with Russia. He attacked the administration's decision to drop plans for a missile defense system in Poland and the Czech Republic—calling it a sell out to Russia. "If that gesture was designed to inspire good will from Russia, it clearly missed the mark. The Russian government defended the dictator in Damascus, arming him as he slaughtered the Syrian people," Romney said. "We can only guess what Vladimir Putin makes of the Obama administration," Romney added. "He regained the Russian presidency in a corrupt election, and for that, he got a congratulatory call from the Oval Office." Romney made no mention of Putin's close relationship with former President George W. Bush, who courted the Russian leader in hopes of building a better relationship with the country. Romney repeatedly cast Obama as an apologist who has lacked a clear foreign policy vision. He called "weakness and indecision" the "surest path to danger" for the country. You have that president today."